This intensive five-week blended learning course will prepare you to more effectively facilitate The Five Behaviors of a Cohesive Team® powered by Everything DiSC® profile and program, including teaching you how to create and deliver a custom workshop. The self-directed online work includes interactive activities to help them absorb the principles of The Five Behaviors model. During the live sessions, you’ll practice facilitating activities with small groups and explore challenging “what-if” scenarios that could come up during your workshops. 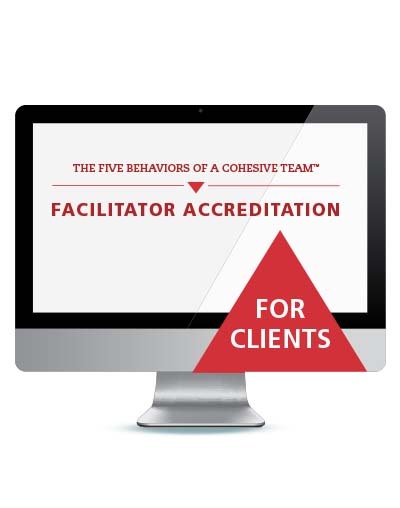 The Five Behaviors Facilitator Accreditation will give you the tools and confidence you need to master this amazing program—no matter what a team brings to the room. Access to The Five Behaviors of a Cohesive Team Facilitator Kit is required. The kit is not included with the course. You may purchase the kit separately, see the facilitation toolkit tab. *Must register at the same time, for course date; contact South Creek HR directly.